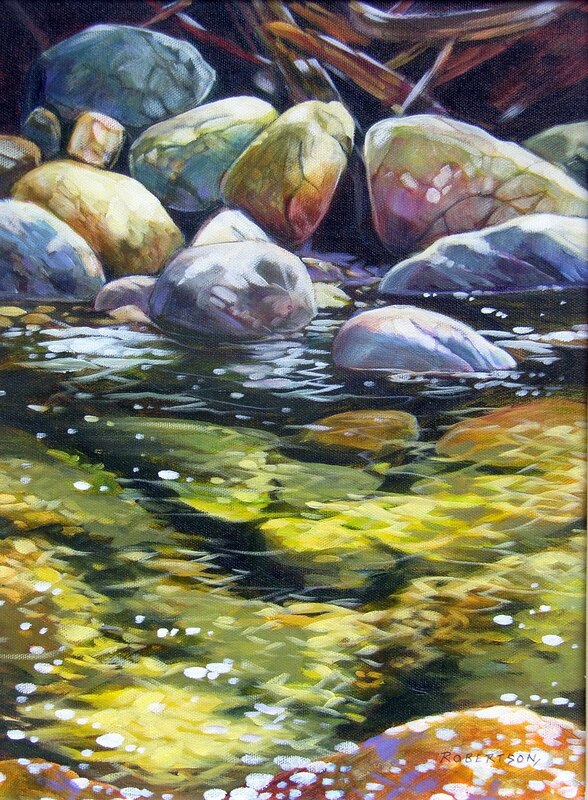 This painting was started as a demo for my intermediate class in Vancouver. They wanted to see how to paint rocks underwater and reflections. It's really a matter of observation, more than technique. Gotta paint what you see and forget what the subject is. I 'm going to auction this painting off as a fund raiser for the Red Cross to support their work in Japan. If you want to make a bid, email me at jrobertson13@shaw.ca. I will post the bids on this blog each day until Thursday, April 7th. Starting bid is $50.00- payment by cheque or money order only. "Above and Below" 12 x 16" acrylic. This is actually only my second lighthouse painting- amazing to have painted for 25 years in BC and not have painted more lighthouses. The reference photo was taken from the ferry on the way to Victoria. My reference was murky and gray and I had to use the zoom on my camera, plus crop the photo quite a bit. Still, the 'bones' of the image were good and I enjoyed playing with color interpretations. In my ongoing battle with skies, I think this one turned out pretty well, although I really worked hard to get it. This weekend, [March 26 & 27] , I will be painting in the Birthplace of BC gallery here in Fort Langley- Saturday and Sunday afternoons. Drop in and say hi if you're in the area. 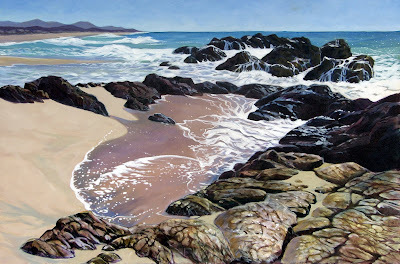 Also, for those looking for an acrylic workshop, my next one is in West Vancouver on April 16th & 17th. Called " the Elements of Landscape", it's an intermediate level workshop. More info can be found on my website and I'm happy to answer any questions you have about the class- just email me. Just finished this painting today. The image will go in the catalogue for the annual Painters at Painters event in Campbell River. This will take place May 27th to 29th this year. It's our favorite event of the year- a chance to mingle with some of the best painters in BC and catch up with many old friends. I had a request from one of my galleries to do a painting like this- this size and subject matter. They have a client interested in getting one of my paintings and this is what might work for them. I don't mind doing paintings for people by request, as long as the subject is something I would paint anyway. For me, this is more comfortable than a commission, which is a situation loaded with pressure- for both me and the client. This way, if they like the painting they can take it and if not, it's available for someone else.